Teaching tips, differentiation, Classroom Connections and Assessments , etc. Have the class sit inside a specific area; if possible, a circle or square already marked on the ground. The children should be seated as a group, inside the space (as opposed to sitting around the perimeter of the space or in a long line.) If you are working outside the children should be facing away from the sun when they look at you. As much as possible, encourage the leaders to move across the room from boundary to boundary, as opposed to a circle around the perimeter of the boundaries. Boundaries show us where it is safe to play. In sport, boundaries tell us where to play the game. During this lesson you will introduce the concept of boundaries. This basic concept will be the basis for all your movement lessons, establishing where it is safe to move and play. 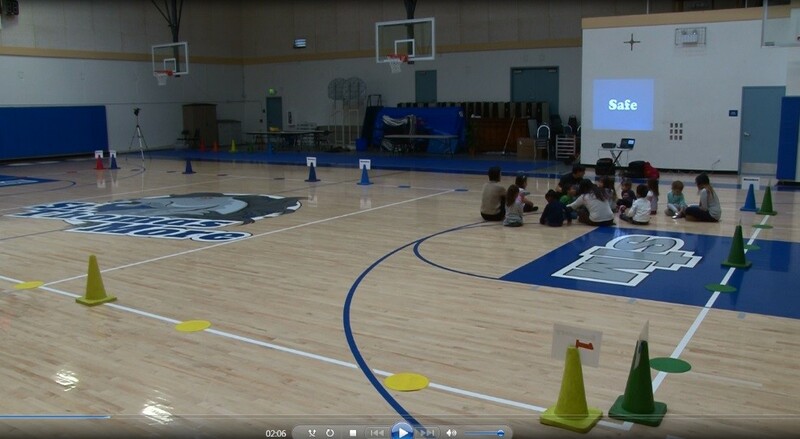 Set up your activity space with the cones and spots as boundaries. Remember that the NASPE guideline is a 5′ x 7′ activity space per child. Review the activities moving with the children as you show and tell them what they are to do. Even when it seems like what you are doing is very easy, remember it’s often all new for the children. As you use all the activities during the week or over several weeks, you will reinforce and solidify the concept of boundaries, which is important for all movement activities. Boundaries Introduction; Beginning the journey around the boundaries! Do this for every boundary, traveling to each of the six different colored boundaries. Repeat this as many times as needed to ensure the children understand what it means to be inside the boundaries. They will have fun. Keep the focus on safety reminding the children to travel safely, look where they are going and to stay in the boundaries. Follow the Leader – Traveling through the room space, inside the boundaries, moving from boundary to boundary criss cross and zig zag around inside the boundaries. Music: Following the leader from Peter Pan. Show the children the word “Follow”. Explain to the children that the word follow in our game means to travel where the leader travels. You don’t have to travel the same way that the leader travels, but you need to follow the leader all around to the different boundaries. Don’t encourage a line, encourage the children to follow you as you move around inside the boundaries. Explain to the children that you will be the leader and everyone is to follow you. Travel around the space using different ways of traveling, complimenting children who stay in the boundaries, and the children who are following you. Describe the things you pass, like the cones and the spots and colors. As you get close to a boundary, reinforce where the boundary is and that you are traveling inside the boundaries. After you have led them around the boundaries for 1 rotation of the song, choose a child to lead as you continue playing. When you stop to pick another leader, announce to the class who the leader is and tell them that you all will follow them to the different boundaries. You don’t need to officially stop the activity. Keep the music playing and just pick a child to be the leader. You can help them by suggesting a color boundary to move to if they cannot think of one. Ask the leader to take you to a new boundary. When you get there, ask another child to be the next leader to take you to another boundary. Keep choosing new leader until everyone has had a go. The children will have traveled to all the boundaries and you will be able to assess each individual’s general understanding of the boundaries, leading and following. Compliment the children that switch to the new leader quickly to create that expectation for the whole group. This will be your chance to observe the children more closely and address individual needs. Have the children gather near you and the video source. Review what you covered today, the equipment and the boundaries, follow the leader. Stretch the legs with three stretches. Begin teaching the children how to stretch properly and that we stretch because exercise actually causes our muscles to shrink! We stretch them to keep them flexible so they aren’t sore. You can even teach your children the names of the muscles as you stretch. Rainbow/Tornado Talk to the children about Tornados, Hurricanes, or really strong storms. Talk about how they create a big mess and sometimes after a big storm things are thrown all over. Explain that when you mess up the gym during mess-up/Clean-up that it is like a tornado came into the gym. Talk about rainbows and that they come out after a storm and everything looks fresh and clean! That is how the gym looks after we “Clean-up”! Teaching Tip Establish and use a number of different ways to divide the class into pairs or small groups. Consider height, age, closest in proximity, hair color or length, clothing colors, equipment colors, etc.